So, you’ve made the decision: It’s time to straighten up. You’re tired of being embarrassed by your smile, and you’re tired of the headaches, soreness, jaw pain, snoring, worn teeth, and unhealthy gums that come from misaligned teeth and an incorrect bite. You’re ready for a healthier, more beautiful smile. You’re ready for Invisalign treatment. After our initial consult, where we discuss whether or not Invisalign is an option for you, we have our “Records” appointment. During this appointment, we’ll be taking pictures as well as impressions of your teeth. The pictures will be great for before-and-after comparisons, but they also let us show you different views of your teeth that you haven’t seen before, and we can point out certain areas we’ll be focusing on or what changes you might expect. As far as the impressions go, don’t worry—there’s no goop in sight. All of our impressions are digital. We use a scanner (the same thing we use for our same-day crowns) to capture images of your teeth. It takes a little longer than the goop, but it’s more accurate and the scans are uploaded immediately to the Invisalign lab instead of needing to be mailed. After photos and scanning are complete, our first appointment is done, and you’re free! While you’re out doing fun things like being warm or enjoying the sunshine, I’ll be sitting here in the Antarctic/my office, sending all your information to the Invisalign lab. Within a few days of receiving it, they’ll send me a mock-up of each stage of treatment from start to finish. I make any modifications I deem necessary, then send it back. Once I receive their new mockup and give my approval, the lab starts manufacturing your aligners and ships them to us once complete. This whole process takes approximately three weeks. Once we have your aligners, we’ll bring you back for our “Delivery” appointment, which sadly does not involve pizzas or babies. At this appointment, we’ll be testing out your first set of aligners, adding attachments to your teeth, and potentially doing something called Interproximal Reduction (IPR). IPR is something we use only rarely, but it’s essentially lightly sanding the sides of specific teeth to create a little extra room. It’s not painful (also doesn’t require a shot), and won’t be noticeable to you—we’re working in tenths of a millimeter. After adding your attachments and completing any necessary IPR, we’ll send you home with your first several trays (the kits also include care instructions). From then on, you’ll be wearing your aligners 22 hours a day (taking them out to eat, brush, and floss), and changing to the next set every two weeks or potentially every week. You may have some soreness the day after you switch to a new set, but this should resolve quickly with consistent wear. We’ll bring you back periodically for check-up appointments to verify the progress of your Invisalign treatment, give you your next several sets of aligners, or make changes to the attachments. As long as everything is fitting properly, you won’t need to see us too much. Of course, if you have any issues like a tray isn’t fitting or an attachment comes off, you should contact us! We’ll be happy to bring you in to see what we need to do to fix the issue. After we’ve gone through the planned treatment stages, we’ll evaluate our final results to see if we need to make any modifications or touch-ups. Once we’re satisfied, we’ll take off our attachments and switch you to retainers for the same 22 hour set up until the teeth re-stabilize (your teeth get a little loose when we’re moving them—this is perfectly natural, and it usually only takes a few weeks for them to get back to normal). From this point on, you’ll just need to wear retainers at night. Much like elephants (but unlike my mother), teeth have great memories. Retainers prevent them from going back to their original positions. In some cases (mostly those where we had a lot of spacing), we may recommend a wire that is cemented behind the front teeth to provide retention 24-7, as these teeth are quicker to relapse. With that done, all that’ll be left for you to do is enjoy your beautiful, healthy smile—courtesy of Silberman Dental Group and Invisalign®! This blog was originally written for The Silberman Dental Group by Dr. Rebecca Triplett. 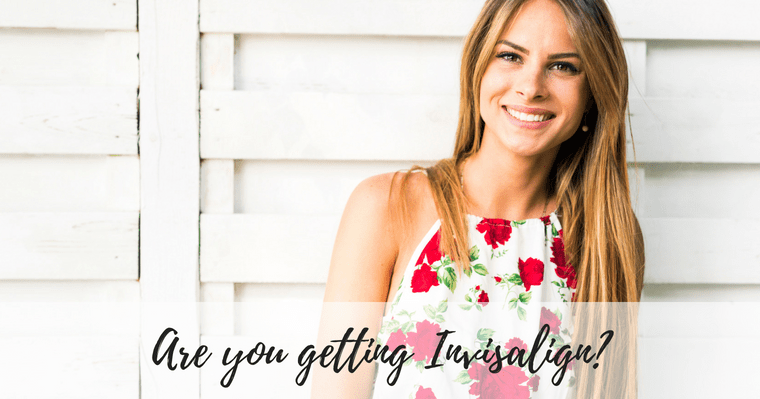 Have any other questions about your Invisalign treatment? Call us at 301-885-2505 or leave us a comment below! Great article. Wow. Amazing content. Thank you for sharing! 5 stars!